Why stand in a never ending queue to pay the electricity bill when you can just sit at the comfort of your home and pay online? Not only is it quick, it takes just 5 minutes once you register. A great feature of the KSEB site is the feature to add multiple consumers to one login. You can add your parents EB details, your business and even your friends & relatives. Apart from paying the bill online, you can also register complaints and check your complaint status. The site is very easy to navigate, below is the step by step process of Kseb online bill payment showing how to register and pay Kerala electricity bills online. For KSEB online bill payment Quick Pay option, scroll down to the next section. For Paying bills through Quick Pay option, you do not need to be a registered consumer. You do not need to have a login id or password. Quick Pay option is useful for those who pay the Kerala electricity bills online on behalf of others. For those who pays their KSEB bills online regularly, it is good to use the below option. Step 1: Go to website -https://wss.kseb.in/. If you are a logged in user and wants to pay the bill alone, go to Step 12 directly. If you want to register, proceed to Step 2 to register newly. Step 2: Sign up if you are a new user. You will need to enter the consumer number and bill number. The system allows you to choose your login name and password. Step 3: Enter your phone and address details and click “Register”. Step 4: Once registered successfully, you will have to log in. Step 5: Once logged in, you have the option register and unregister consumer numbers. Step 6: Enter the consumer number, bill number and consumer nickname to register a new consumer. This facility is for families where one login can be used to pay multiple bills. Step 7: You can update your profile by clicking “Update profile” on the left navigation pane. Step 8: You can choose your communication preference as Phone, Email or Both and click “Update”. Step 9: You can also change your password by clicking “Update profile” -> “Change password”. Step 10: To update profile and communication preferences for other consumers, click on the consumer name/number on the left pane. Step 11: Choose the communication preference and update the consumer details and Click “Update”. Step 12: Now, to pay the bill, click “View bill & pay”. Step 13: To pay the bill, click the respective consumer number. The details of pending bills will be displayed, click “Proceed to pay”. Step 14: You will be given an option to pay by Debit card, Credit card or Net banking. Once, you choose payment mode of your choice and pay, a confirmation message will be displayed along with the receipt number. Step 15: Another option for paying online, is “Quick Pay”. Step 16: You just need to enter the consumer number and bill number and click “Submit to see the bill”. Step 17: Your bill details will be displayed. Enter either your phone number or email and click “Proceed to payment”. The payment method will be the same as shown above. Step 18: To view your previous bills, payment details and consumption history. Click “History”. Step 19: Once completed, click “Logout”. 2. Select the 'Electrical section'. 3. Enter your 'Bill Number' and 'consumer number'. Consumer number will be available in your EB card. Your last Bill Number can be given in the bill number field. 4. Click on 'Submit to see the Bill' option to see the bill details and make payment. 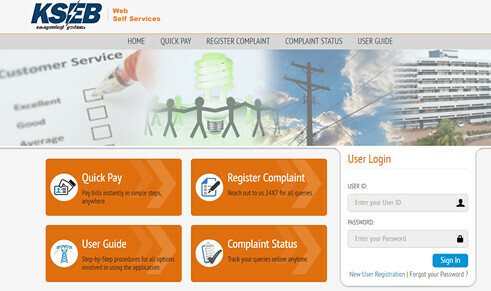 Hope the guide on 'KSEB Online Bill Payment - Pay Kerala Electricity Bill Online' is useful for you. Let us know if your have any queries on paying the electricity bill online through comment section. We are happy to help you. We are glad if you want us to correct any information provided here.